Photo: A boy who was struggling to stay enrolled in school is now supported with school supplies, hygiene supplies, nutritious meals, and after school tutoring at our Children’s Hope Center. We are happy to report that our new Children’s Hope Center on the island of Cebu opened during the second week of March. 30 children are enrolled in the Hope Center’s after-school care program which includes homework tutoring and other activities, along with snack and meal services for children suffering from extreme poverty. The program model has proven highly effective; this is our 5th Children’s Hope Center launch — the Hope Center model was first established in 2011 by our India team in the slums of Hyderabad, South India. The Cebu program is held in a new multipurpose facility on our main campus we’ve been slowly working on for about a year now. Our native team brings the children to the shelter after their classes at nearby schools and gives them a nutritious hot meal, assists them in completing their homework, nurtures and guides them on how to live in a suitable manner that blesses their local community, teach them to value their neighbors, boost their self-confidence, and provide them with all the necessary supplies that their schools require. With your support and contributions from our generous donors, we have recently raised enough funds to purchase a 12-seat vehicle to enable our native team to more easily transport Hope Center students to and from school for the after-school care program. One of the new students enrolled in the Cebu Hope Center is Joella, who is thankful because she believes that this program will help her excel in her education and live a life full of hope. Before she was enrolled in our Children’s Hope Center, she and her brother were not able to attend school consistently, they did not have access to a proper diet, and they could not afford school uniforms and other necessities required to attend classes at school. It was also hard for her to study for her lessons or do her homework because she helped her parents while they worked to provide for their children. Our Hope Center program blesses Joella because we provide her with hot meals, and we help her with her assignments. Joella is very thankful for this great opportunity, and for the provision of a school uniform and hygiene supplies. Her parents are also extremely grateful, having a burden lifted off of their backs to see one of their children be able to attend school and be encouraged in their studies at our Children’s Hope Center after-school care program. 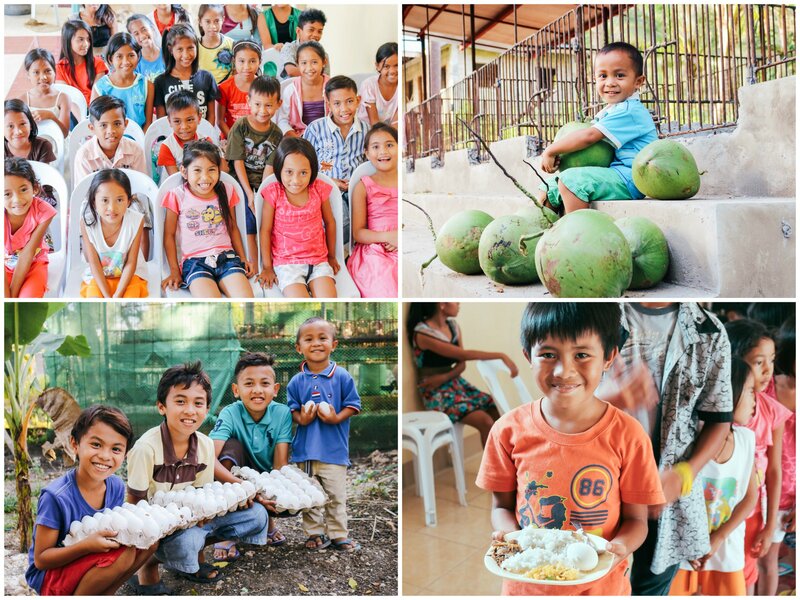 Photo inset: (Top-left): Our new Children’s Hope Center on the island of Cebu recently opened, providing after-school care to 30 children. (Top-right): Our Cebu team has expanded its farmland enterprise to include newly constructed pig pens which will hold more pigs; our coconut grove is also flourishing. (Bottom-left): Our Cebu team is grateful for an abundance of eggs from its hen house located on our main campus. 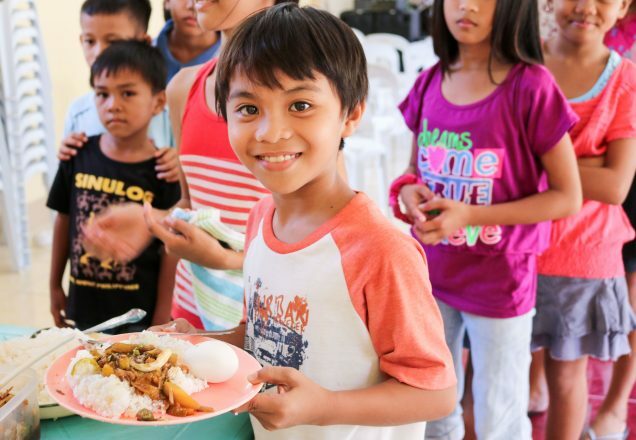 (Bottom-right): A boy attending the Hope Center program is thankful for a nutritious meal after school. In other good news, we have expanded our piggery to house 4 more pigs which brings the total to 10 piglets, and construction has been completed on our stronger pig pens made of concrete. Our old pig pens were made of bars and galvanized iron pipes which were easy to destroy and lasted only 1-2 years, whereas the new concrete pig pens are much more durable and will last 5-8 years. This newest micro-venture at our farmland will be a valuable source of income for us since each healthy, mature pig sells for $175 at market. We currently have one large pig ready to sell. The good yield is attributable to strong demand in the market as pork is a local staple. The profits from the piggery will help provide a portion of the additional funds required to operate The Children’s Hope Center in its brand new, initial stages. We are thankful that our banana grove is flourishing, and that we were able to plant new, native fruits on our plot of land — we recently planted pandanus fruit, bignay berries, and tumbaga fruit. In pursuit of our sustainability goals, our team has also maintained a hen house project which currently consists of 146 hens that produce at least 120 eggs per day. We expect production to increase as our newest batch of young chicks grow and mature. Things are also going very well at our two fishery ponds which are currently full of healthy fish. The main concrete-lined pond holds a volume of approximately 20,000 gallons (75,000 liters) of fresh water pumped from our on-campus well. The supply of fresh fish vastly supplements the nutrition of our students and children in our outreach programs. Our coconut grove is also flourishing with 145 trees yielding coconut harvests 3 times annually — we reap a harvest of 1,400 coconuts per year. The younger coconuts are used in the children’s diets — after the nuts are opened, the soft sweet meat is delicious to eat, and the juice is refreshing and hydrating. Coconut milk, made from the meat of coconuts, is full of every good thing the body needs to survive including vitamins C and E, many B vitamins, and magnesium, potassium, phosphorous, and iron. The children often enjoy buko — the local name for the young coconut meat — in salads prepared by our native staff. All of these efforts not only aid in providing nutritious, organic ingredients for our children’s meals, they also help diversify and increase profits, empowering our local team to reach even more children.